Traditional Ju Jutsu is considered a true Japanese martial art. Traditional Ju Jutsu systems all have documented and verifiable lineages. It is composed of techniques such as joint locking, throwing, sweeping, reaping, choking, and striking with all parts of the body. Weapons' training is also an integral part of Ju Jutsu, typically, knife, sword, and staff. The essential principle of Jujutsu is to defeat the enemy by any and all means, using minimal force. Force rarely ever meets force directly and techniques should not need to best strong-armed to be effective. Movements emphasize circularity to take advantage of the attacker's momentum to break the opponents balance in preparation for joint locking or throwing techniques. Traditional Ju Jutsu systems can be utilized offensively as well as defensively. A brief list of some representative ryu ha would be Hontai Yoshin-ryu, Takenouchi-ryu, Saigo-ryu Aiki-Jujutsu,Tenjin Shinyo-ryu, Daito-Ryu Aiki-Jujutsu, and Sosuishitsu-ryu,to name just a few. In a Nihon Jujutsu Ryut raining utilizes Japanese terminology, the primary method of instruction through the use of kata. Students are instructed in the history, culture, and traditions of the ryu. The environment is one of respect and discipline (self-discipline, and not militarist Training frequently presents situations with historical significance (wrist grabs, sword attacks, defenses from seiza to name just a few). Although these arts are most commonly referred to under the general term "Ju Jutsu," there were many different names for these types of techniques and tactics, varying from ryu to ryu. Hade, hakuda, jujutsu, kempo (Sekiguchi-ryu, Araki-ryu, Seigo-ryu), koppo, kogusoku, and koshino mawari (Takenouchi-ryu and Yagyu Shingan-ryu), kowami, kumiuchi,shubaku, tode, torite, yawara "jutsu" (Tenshin Shoden Katori Shinto-ryu,Tatsumi-ryu and Shosho-ryu), and yoroi kumiuchi (Yagyu Shingan-ryu) are a few of the words that were used over the years. In some traditions, such as the Takenouchi-ryu and Yagyu Shingan-ryu,more than one term was used to refer to separate parts of their curricula. Each of these words denotes systems with different contents or slightly varied technical characteristics. Under the feudal system of ancient Japan, several military arts flourished among the bushi (samurai). Among them was jujutsu. However, because knowledge of these fighting arts meant survival to the warriors who used them, there was not much publicity or documentation given to them among the various schools. What records there were of the development of jujutsu were probably destroyed in 645 AD-when the National Archives of the Regency of Taishi Shotoku were destroyed during the Taika takeover. However, other sources prove that the art is definitely of Japanese origin. Although the art of jujutsu dates back thousands of years, the art actually began to blossom during the Edo, or Tokugawa era (1603-1867). "Some Japanese historians regard the Takenouchi-ryu, founded by Takenouchi Hisamori, and Yoshin-ryu, founded by Akiyama Yoshitoki, as the core jujutsu ryu-ha from which all jujutsu system's sprang." With the increased popularity of martial arts tournaments and the many disputes between the daimyos of Japan, techniques were being developed and refined that would stand the true test of "no holds bared" tournaments.Schools were founded with systematic training methods, techniques were cataloged, and development was at an all time high. Because of the violent period during jujutsu's development, it emerged as one of the few martial arts that does not claim to be only a defensive art.The creators and following refiners of jujutsu were not so naive as to believe that one should only strike out in response to anattacker's assault. They recognized the theory that sometimes a good defense is a strong offense. "Ni sente nashi,"(There is no first attack), which is the maxim of karate, but has no place in jujutsu. During this time of growth and development in Japan, "several hundred jujutsu systems were officially documented and recorded." However, most of these schools of jujutsu differed in name only and not in substance or technique. As the feudal period of Japan waned, the need for jujutsu also began to die. 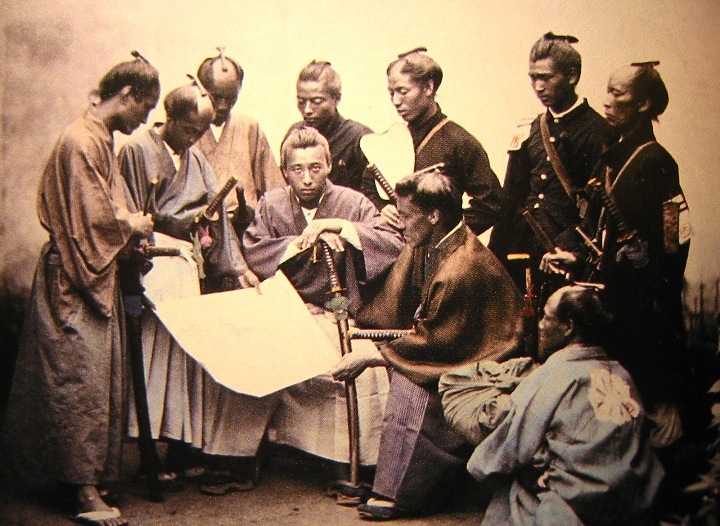 Many school sclosed or fell into disrepute as the instructors hired out their services as bodyguards or bill collectors after the end of feudalism with the Meiji restoration. It was then that a young man named Jigoro Kano began to consolidate many of the jujutsu schools in an effort to keep the art alive. However, Kano made many changes in the art of jujutsu and what developed from those changes ultimately became a sport that he called judo. In developing judo,Kano refined the art to such a large extent that the art was no longer practiced as a martial art. The violent techniques of jujutsu that he felt were too dangerous, or could not be executed during the practice sessions, were replaced by safe techniques. This also contributed to the decline of jujutsu. Translated into English, jujutsu means "gentle, pliable,or flexible art." The "gentleness" of the art is expressed in the execution of the techniques, and is not reflected in the effect upon the attacker, except at the discretion of the person executing the technique. Using the techniques, a person may either control an attacker with a minimum amount of pain (neutralization),or use a technique designed to produce a great deal of pain (immobilization). Many times the only difference between neutralization and immobilization is the amount of pressure applied to the technique. Other factors that determine the difference would be the attacker's resistance,the direction of the line of force, and of course, the circumstances of the situation where force was deemed necessary. Jujutsu is the most potentially destructive of all of the martial arts. According to martial arts expert and historian, Donn Draeger, "It was always a 'no-holds-barred' type of fighting." "Jujutsu proper includes methods of kicking, striking, kneeing, throwing, choking, joint-locking,use of certain weapons, as well as holding and tying an enemy. "A student proficient in jujutsu has studied the techniques that were the forerunner of judo (throws, chokes and leverage); Aikido (joint locks and circular control of an attacker); Karate (punching,striking and kicking); and weapons (yawara stick, hanbo, jutte,and knife--tanto). However, Jujutsu is not defined as either an offensive art or a defensive art. The execution of the techniques depends upon the motion and attitude of the attacker, and seriousness of the encounter. A jujutsuka learns to exploit the weaknesses of an attacker's motions and capitalize on those weaknesses, and although the jujutsuka is obligated to use good judgment and responsibility in the selection and execution of his techniques, the techniques are many and varied and can be violently effective. The techniques of Ju Jutsu can be used against one attacker, or multiple attackers, and whether the attackers' are armed or unarmed. According to Draeger, "Jujutsu is often erroneously defined as unarmed fighting methods applied against an unarmed or armed enemy. Bujutsu, while stressing unarmed techniques, also deals with small weapons techniques, which are, incidentally, equally applicable to larger weapons. Jujutsu can, therefore, be defined as various armed or unarmed fighting systems that can be applied against armed or unarmed enemies." As with all jujutsu techniques,the amount of force is controlled and the line of force (direction)is controlled. With very minor changes in the position of the jujutsuka's arms or legs, an attacker can be thrown on his front, back, or side, making break falls very difficult, if not impossible.The point is that the throws are taught from several angles and in several directions so that, once again, pain results at the discretion of the jujutsuka and not from the execution of the technique. This method of throwing differs from judo, which stresses throws to the side permitting break falls and safe landings. Also, unlike judo, the throws are taught by grabbing the body instead of grabbing the clothing. Although judo is a direct descendent from jujutsu, the refinements made by Jigoro Kano, Sensei transforming this martial art into judo, left only a surface similarity to the original techniques, and when viewed side by side, the two are quite distinguishable. The most discernible difference between the two is the atemi (striking) employed during the execution of the throw. Jujutsu uses a wide variety that striking in order to unbalance or redirect the attacker's attention, gaining control of the situation. Judo is primarily a grappling system that places rules and restriction on the use of striking techniques, because of this lack of striking, judo is in-effective as a self-defense system. This element of control is an advantage of jujutsu over punch and kick defense systems (Karate, Tae Kwon Do, etc.). However, controlling techniques can regulate the amount of force so that the effects can be judged immediately and adjustments made in the technique, if necessary.